William Thomas Mills | Launceston Then! William, who was born in 1877 to William J. And Matilda Mills at the Walk in Launceston, was for the majority of his life was the mainstay of Launceston’s St. John Ambulance. His father was a carpenter/cabinet maker. William married Kate Williams in 1904 and they set up home in Westgate Street. They had two sons William Shilson b. 1906, and Edward Terry b. 1908. He passed away in 1953 and here is the transcription from the Cornish and Devon article that detailed his life which gives an insight into the birth of the St. John Ambulance Brigade in Launceston. Mr. W. T. Mills, of 3 Westgate Terrace, Launceston whose sudden death on Thursday week was reported in our last issue, was a man who had given unstinted service to the community in his lifetime in Launceston. Perhaps his greatest service was given through the Launceston Division of the St. John Ambulance Brigade, of which he was appointed secretary on its inception 38 years ago (1915) — an office he held right up to his death. His own story is the story of St. John in Launceston. During the First World War, the Town Hall (above) was converted for use as a convalescent hospital for wounded men brought back from the front. 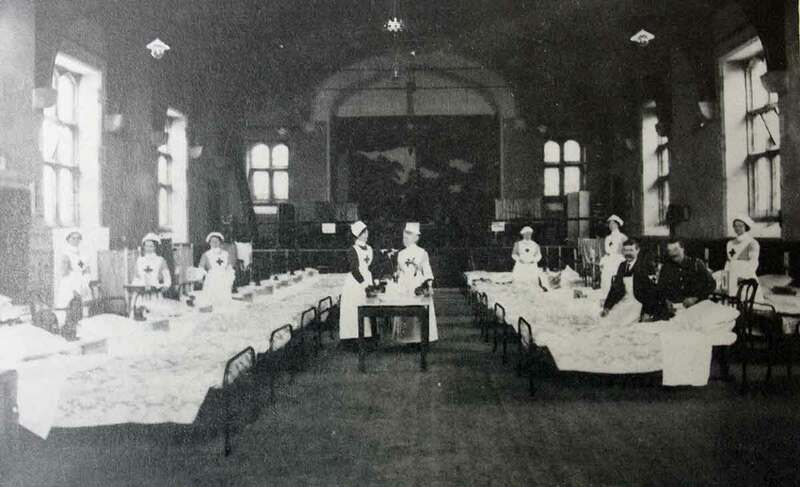 This hospital was in the charge of Mrs. J. C. Williams (Werrington Park), with Dr. T/ W. H. Shepherd as medical officer. Dr. Shepherd asked for volunteers for night orderly duties and several local men volunteered, among them William. Some already possessed St. John first-aid certificates, for Dr. Shepherd and other local medical men had held classes of instruction, but no local St. John organisation existed. William, in fact, had taken his first first-aid exam in 1896 — 52 years ago — and he could remember the day well, for it was also the day of the big fire at Race Hill, which is still talked about in Launceston, and he and others were late for the exam because of that. Dr. Shepherd was a very enthusiastic First Aider and it was he who conducted the lectures in 1896. He obviously had had the formation of a St. John Division in mind, for when the volunteers for the hospital night orderly duty came forward, he insisted on all of them possessing certificates. Accordingly, the men all took the exam, and so many of them passed that there were enough to form a St. John Division, and early in 1915 Dr. Shepherd saw the culmination of his efforts — the formation of the Launceston St. John Ambulance Brigade. It was William who signed the first form of application to form this Division and he carried out various other ‘writing duties’ as termed them, so that on formation of the Division it was natural that he should automatically find himself in the post of secretary. In fact, under the eagle eye of Dr. Shepherd he was, as he would recount later, ‘secretary, superintendent, office boy and everything else’ in those early days. The Division soon became well established, however, and William found that the secretarial work was more than enough for one man to do. Consequently, later that first year, the late Mr. Richard Heard was appointed superintendent and William became the official secretary. William has a host of memories of his St. John work down through the years — a veritable verbal history of the movement locally — from the first days when, he said, the main duty seemed to be the keeping of almost recovered Australian soldiers in their hospital beds — or of smuggling them back into the hospital late at night! He and Richard Heard worked side by side for many years from those beginnings, and twenty years later they both had the privilege of journeying to London together and being invested as Serving Brothers of the Order of St. John, a well-merited recognition of their services for the movement. William who was active in his Brigade work to the end and who held the rank of Ambulance Officer, would recall that after the Town Hall hospital closed down, the Division carried on maintaining their first-aid efficiency, practising assiduously and carrying out any public duties to which they were called. They met weekly at the Firs Station in those days, and worked in close conjunction with the Fire Brigade. 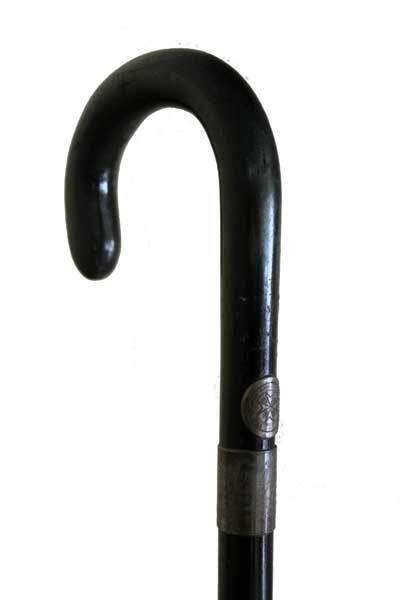 It was in 1921 that the Launceston Division first undertook the work which made their black and white uniforms so familiar over the whole of North Cornwall and West Devon – in that year they received their first ambulance, and William could well remember that old vehicle, a Ford, for he travelled many thousands of miles in it. He remembered too, the Austin Ambulance which replaced it and which was paid for by local appeals a course that was followed when a third vehicle, again an Austin, was acquired. Public recognition of the fine work being done by the Division perhaps culminated in the splendid response which enabled the present Ambulance Station in Westgate Street — just across the road from William’s home — to be opened practically free of all debt, in 1935. That building stands today, a memorial to the energy and popularity of past members of the Brigade, and of none of them more than of “Bill” Mills, whose unhesitating and unstinting work played so large a part. William held the St. John Long Service Medal with no less than four bars, an almost unequalled record, representing 35 years continuous — and efficient — service, and his death came just before he was publicly accorded the highest honour St. John can bestow on a lay member: admission as an Officer Brother of the Order. His splendid record had not gone unnoticed, and this well merited award had in fact been granted. But in view of his health, he could not have gone to London for the formal investiture, and the ceremony awaited the visit of a high official to Cornwall and Launceston for that specific purpose never, however, to be fulfilled. 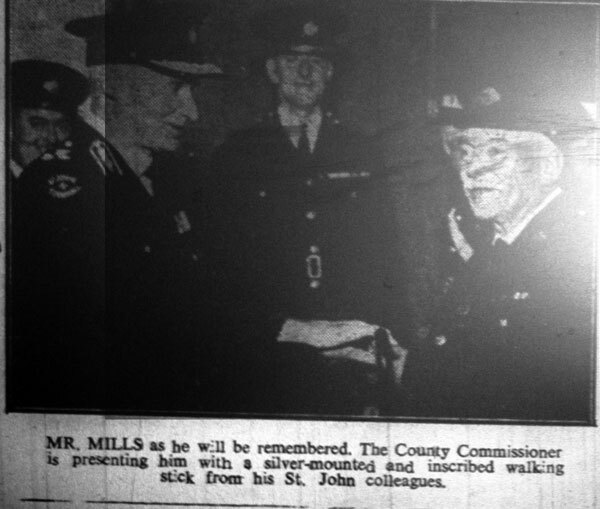 Only just over a week ago, special reference was made by the County Commissioner at the St. John annual meeting for Cornwall to the wonderful record of service William Mills had established. But his service to the community did not begin and end with his St. John work. The following is but a partial list of other posts this public-spirited man had held in Launceston: Secretary, St. Thomas Football and Cricket Club; assistant secretary, Launceston Working Lads Institute; secretary, Launceston Football Club; secretary, Launceston and District Football League; Chief Officer, Launceston Fire Brigade; treasurer, Launceston Bowling and Tennis Club; Member of the St. Mary Magdalene Church Council (22 years). For 55 years he was in the employ of Messrs. Peter, Peter and Son, Launceston as a book-keeper and during his time with the company he served under four generations of the Peter family. He also saw service in the First World War. He also taught book-keeping at The Passmore Institute. William like many of his collegues in the St. John Brigade was also a member of the Launceston Voluntary Fire Brigade joining in 1904, serving as its secretary for 29 years and as chief officer for 10 years. During his time he had witnessed the brigade being modernised from an old manual engine which was last used at a fire at Pennygillam in 1911, at which the engine failed to operate to what was cutting edge technology at the time, a steam fire engine. 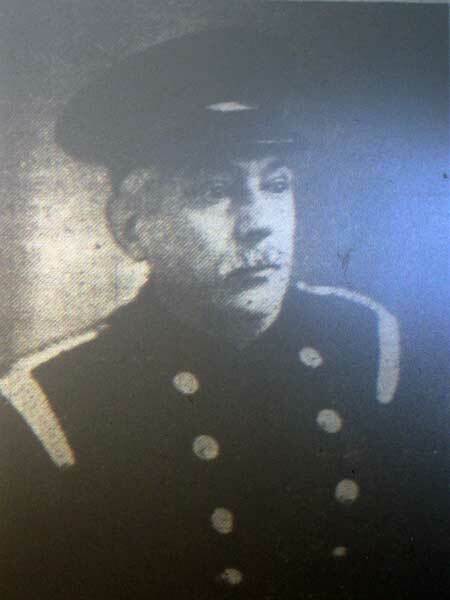 He retired from the fire brigade in 1933.